Picking up in mid-morning on Sunday, I'll mention that there were a number of interesting seminars presented at TAVES including a follow-up to last year's seminar by Roy Gregory of The Audio Beat. This year Roy covered the crucial issue of speaker placement. As much as I enjoyed last year's presentation and wanted to attend again this year, I remembered that the time committed to the seminar cost me coverage of a small hallway full of rooms that I inadvertently overlooked. And we don't want to make that mistake again. Other seminars included Home Theater of the Future... Today, and Cutting Edge T Technologies, as well as The Future of Hi-Fi and another one on DSD DACS. And even one on Recording Classical Music. Lots of available enlightenment, for sure, but let's get back into the trenches. Linar Audio resides deep in my memory back when I covered the Montreal show for the rec-audio.high-end newsgroup in the mid to late 1990s, but it had long since fallen off my radar. 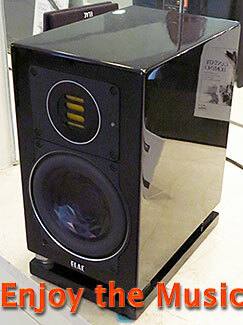 It was founded in 1996 in Toronto by Victor Sima after selling his earlier business, Sim Audio. Victor sought to create a solid state amp that sounded like a tube amplifier and used J-FET on the input and MOSFET on the output stage. There was no global feedback in either the preamp or the power amp nor were there any capacitors in the signal path. This was how it began back in 1996, and it is how they are built today. I spoke with Gilles Dupuis who bought the company in 2009 and moved it to the Ottawa region where he lives. 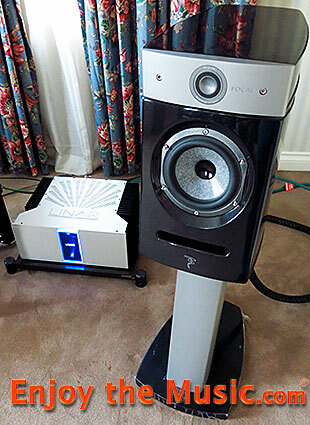 He mated his 200wpc Class A monoblocks ($16,000/pr) with the Focal Scala V.1Utopia (in white, only $21,500 as a demo model) which seemed only slightly large for the room. The music was very smooth and the soundstage well delineated. Even more important, I felt an emotional connection with the music that is rare for me when listening to solid state gear. Adjusting for the size of the room and the speaker model, this is as good as I can recall ever hearing a Focal Utopia speaker � not that they ever sound bad, but this combo excels. Linar also offers a 50 wpc Class A stereo amp at $8000, and for those who can't stand the heat of Class A, they have a 150 wpc stereo amp and a 500 watt monoblock. While the shape of the monoblock looked familiar, the top plate in particular looked more refined than I remembered. We didn't talk about it at the time, but I subsequently learned that their preamp is rather special, too. The source, by the way, was an Esoteric K-03 CD player. 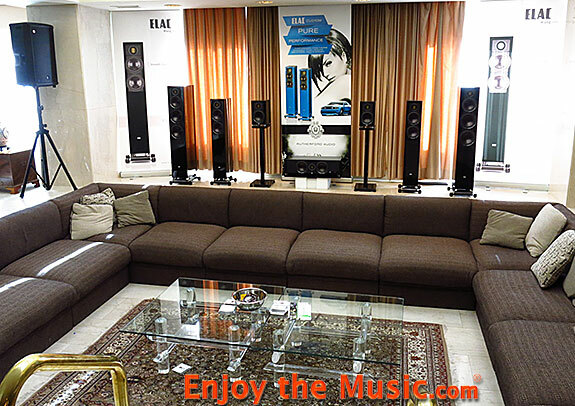 Very nice presentation, here, by Audiophile Experts, who offered show special pricing � the visitors were held in rapt attention. Near the end of the show I returned to this room to find the Focal Diablo Utopia on its dedicated stand sounding just as fabulous with its minus 6dB point at 40Hz. Focus Audio is another brand that had fallen off my radar in recent years, but I recognized Kam Leung from way back when. 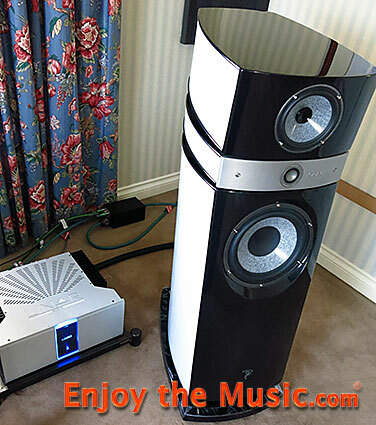 They came back in a big way this year with a straight forward rig featuring their remote controlled Liszt Sonata 35 wpc integrated amplifier with EL34 tubes and double C-core transformers driving a handsome pair of floorstanding speakers. Actually, the amplifier can be used as a power amp with both RCA and XLR direct inputs. The CD player was black and unfamiliar, but I was told it was from the Netherlands. Perhaps it was the wood sides that were throwing me off. The speaker was their new FP 90 BE model from their Prestige Series in a gorgeous wood veneer with high gloss finish, which is their tradition. Presumably it has a beryllium tweeter. It is a three-way with 87dB/W/m efficiency and quite slimmed down from models in the past. Forget everything you thought you knew about EL34 tube amps. The focus of this rig was incredible, with outstanding transparency and great dynamics. On my compilation disc a segment of Bruce Springsteen's "57 Channels" has a refrain where an overdub of the line "57 channels and there's nothin' on" is heard. In a good rig you can make out the lyrics fairly well, far behind and slightly to the left of the main voice. The Focus rig with the FP 90 BE was the clearest I've ever heard the refrain in Springsteen's "57 Channels". It was the sonic equivalent of 4K Ultra HDTV. Too much of a good thing? I could only stay a short while, but it should be easy to tone down the focus with a different tube amp if you wish. We're talking sharp like the sword of a Samurai. I'm sorry I missed the photo op, here. Too much video, not a single still photo. Trust me, it's a beautiful speaker. Onda Systems had a similar straight forward rig as above with an Aesthetix Romulus CD player feeding a ModWright KWI 200integrated amp driving a Chario Sonnet Academy stand mounted monitor from Italy. Onda's cables go from expensive to more expensive largely because they are pure silver. Price comes with that territory. One of their primary features is that the solid conductors are terminated to the solid silver RCA pins of their own manufacture, without using solder, which they feel impedes high frequency signals. Their belief is that cables should not be used as a band aid to fix other problems, but to transmit the signal without editorializing. The music I heard here was pure and clean, but down a touch from the extreme resolution of the Focus Audio system mentioned above�and probably a lot more suitable for the long run. The Rock Star Suite, er... make that the Royal Suite occupied by the Canadian distributor Rutherford Audio cleaned up very nicely from last night's party. A set of racing stripes turned a pair of blue Elac floorstanders into a $7000 limited "Boss Edition" mimicking the Ford Mustang. 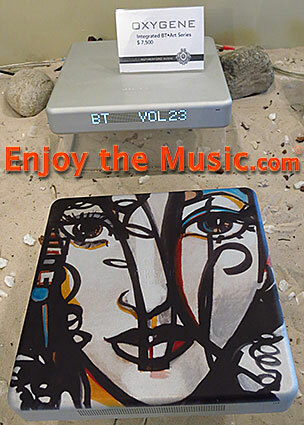 Roksan offered an Art Series of their Oxygene integrated amplifier, normally $6000, for $7500 with art work of your choice anodized to the top of the chassis. 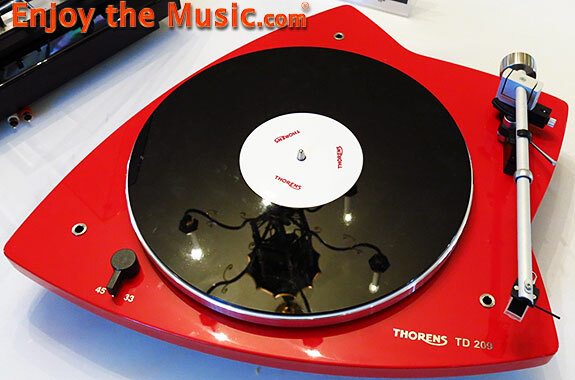 Thorens offered a less expensive version of their guitar pick turntable, minus the suspension and using a less expensive arm, the TD 209 for $1499. Kind of like the difference between a hollow body and a solid body guitar, I suspect. Both the 209 and the more conventional 206 turntable (in red, black or white) with dust cover at the same price feature the new TP 90 tone arm. For the Lifestyle Crowd seeking just the music, please, Elac had a very cool sub/sat system for $2400 in gloss black that you could easily put on a credenza. You could feed it wirelessly from your iPad. The transmitter also fed a pair of very fine sounding bookshelf speakers with three 70 watt a/b amps inside the gloss black speaker. This set-up will be premiered at CES in January at a price less than $5000 which includes the transmitter and a remote that controls four sources and three zones. With two additional pairs of speakers you should be able to keep three teenagers happily isolated. 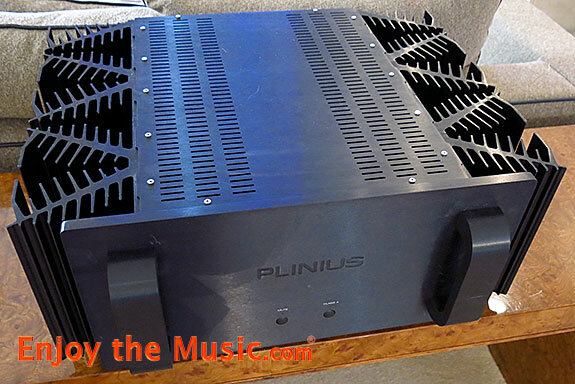 And finally, looking very foreboding in black, was a Plinius power amplifier looking very much as they always have with massive heat sinks taking care of the Class A heat. The insides have been continually updated over the years and the current model is said to be much improved from the SA 100 MkIII I owned over a decade ago. In a room hosted by Coupe de Foudre, one of the premier retailers in Montreal, Danny Labrecque walked me through their rig in English, thank you. The turntable was a Luxman PD-171belt drive model ($6400) with an EMT TSD 15 cartridge ($1950) that was about as naked as a cartridge can get. The preamp (about $10,000) was a Shindo Laboratory Monbrison feeding their Montille CV391 power amplifier (about $7000) with volume controls using CV391 tubes, a rarity, as well as a lot of vintage parts on their original circuits � not the standard circuits found with the more common power tubes. Shindo comes from Tokyo. 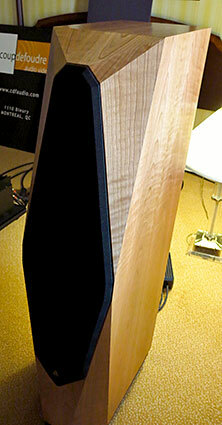 The speaker was a DeVore Fidelity Orangutan 093 ($8500), a very efficient speaker that I've heard in Montreal. 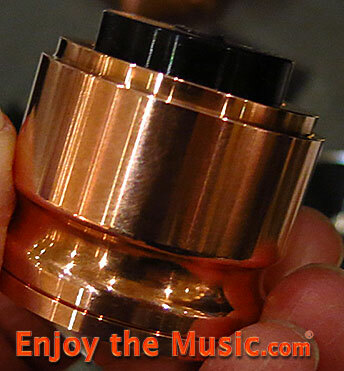 Everything sounded just as fine here � smooth and easy to listen to. All that was missing was John himself, and some photos of this great gear, unfortunately. I did a little better in the next Coupe de Foudre room with Erik Fortier who was showing a much more expensive solid state rig. DSD files were coming from an Apple computer loaded with Audirvana Plus software. A brand new Luxman DA-06 DSD DAC processed the signal and sent it on to the new Spectral DMC 15SS preamp which features a novel floating isolation system similar in effect as running from battery power. From there it went to the new Spectral DMA 200S Series 2 stereo power amp rated at 180 wpc which drove the new Avalon Compass loudspeaker ($35,000). The Compass has the classic Avalon cabinet and the wood was simply gorgeous, as usual. Cabling was also Spectral with the new ul-60 speaker cable being prominent as well as Spectral interconnects. I've sometimes been less than impressed with Spectral and Avalon products, but this was really a very fine presentation. Excellent focus, totally neutral and no hint of glare or irritation with obviously great source material from DSD. All in all a very clean signal. Sometimes, too, it is all in the set-up, and Coupe de Foudre is among the very best. Descending to the 2nd floor I browsed around in the booth area. 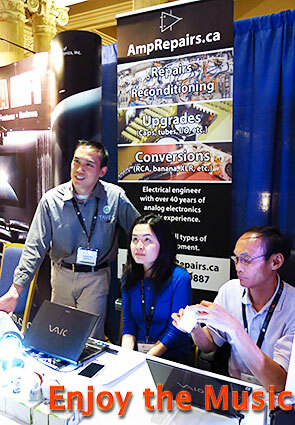 AmpRepairs.ca was on hand to offer repairs, upgrades and connectivity conversions for those who have such a need. 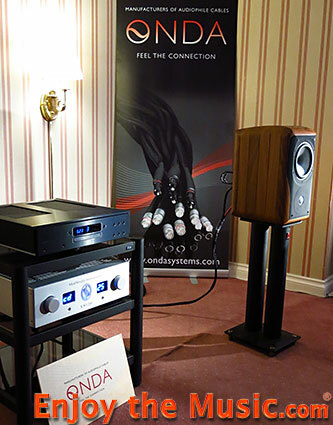 Stepping into the darkened Belgravia Room hosted by American Sound of Canada I was treated to a high powered concert video with surround sound with Acurus amplifiers driving Focal speakers, including their Electra 1000 BE II models ($13,000/pr.). In a two channel system I spotted a little AudioQuest Dragonfly sucking tunes out of a laptop. Usually they feed on mosquitoes. (My wife really loves hers, btw.) It's difficult to just walk into a darkened room and get a grip on the home theater experience�or even walk away with some meaningful information. I've had much better experiences in the past with controlled presentations with both verbal introductions and actual movie presentations. But that format has its drawbacks, too. 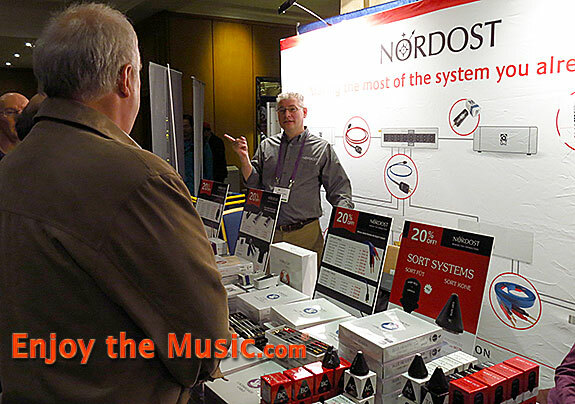 In addition to their room upstairs giving cable comparisons, Nordost had a booth on the 2nd floor where you could buy their cables and Sort Kones as well has have more involved conversations with their sales people. For those who wish to "buy American", this is not a Scandinavian company; their name just sounds that way. I certainly saw a lot of their ribbon speaker cables around the show. 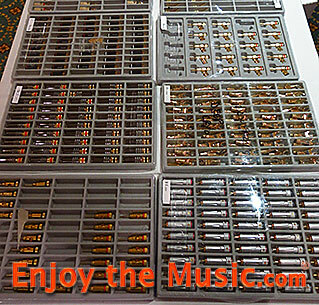 Looking as much like a jewelry store as a cable vendor, Steven Huang of Audio Sensibilities had a long table covered with gold and silver connectors as well as spools of cable for DIYers. Steven's reasonably priced cable line has been growing quite nicely over the years to include some rather serious cable distribution boxes. Further down the table were boxes of select classical music LPs tended by his wife and daughter. And still further down, he shared some table space with a newcomer to the high fidelity audio industry. As in many phases of life, it's nice to have a mentor. See below. 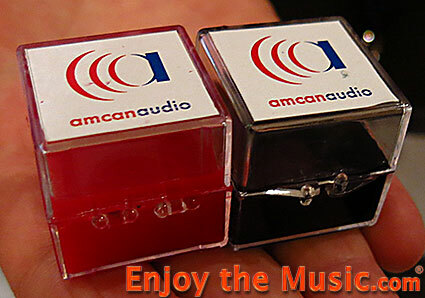 Amcan Audio is a start-up by Todd Kubon who has over twenty years of experience with silicone and the manufacture of prostheses. He noticed that there was no competition for ZeroDust and applied his knowledge to create a soft silicone with better grip that will even pull small pieces of vinyl off a stylus. The stuff looked scary because it is very tenacious and a lot more pliable than ZeroDust. Todd assured me that by using the tonearm lever to lower the stylus into the silicone and lift it right back up, no harm will be done. I've used it since the show and it seems to do an excellent job. It may even do a better job than what Mike Fremer used on the grungy stylus he photographed through a microscope and posted on his site. Somebody needs to get this stuff into his hands soon! It is said to last "forever � a lot longer than three years" and can be washed with soap and water to renew it. The packaged cube costs about $40 as I recall and comes in red, blue and black versions. Todd also uses his knowledge of silicone to manufacture Constant Natural Frequency Isolators, known to the rest of us as "footers" which combine silicone and either stainless steel, brass or copper, each of which provides a different result by combining the different resonant frequencies of the silicone and metal. The details of his footers require an in-depth review. Suffice it to say that they are OEM suppliers to Denis Had (of Cary Audio fame) for his new Inspire line marketed on eBay. Victor Kung of VK Music in British Columbia offers a variety of tube amplifier kits including the prototype TU-8200 with two 6L6 putting out 7 wpc shown here. The output stage can be configured as Ultra Linear, Pentode or Triode mode and includes an auto-bias circuit. It can also be used with KT88, 6550 or EL34 tubes. It has RCA inputs for two sources and a headphone jack compatible with low to high impedance headphones. Price is $725 with 6L6 tubes. 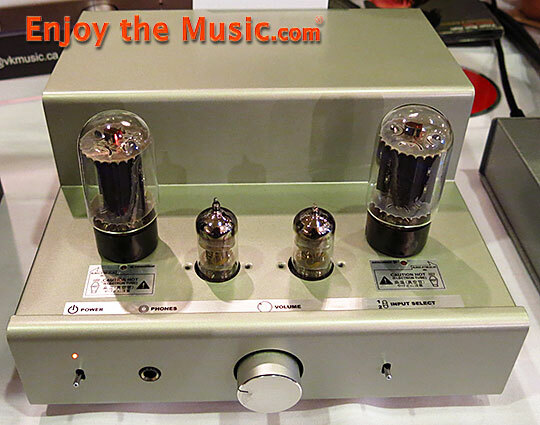 I also liked the style of the Elekit 22 Hybrid Tube Amplifier ($795). There was an interesting full-range monitor with a driver with a wood cone, as well as a 0647 kit version of a 47 Labs CD player that could be an interesting project to build.